For other places with the same name, see Derry (disambiguation). Derry or Londonderry (Irish: 'Doire', meaning 'Oak Grove'), is the second city of Northern Ireland and the fourth largest city on the island of Ireland after Dublin, Belfast and Cork with a population of roughly 100,000. The city has a photogenic location on the River Foyle in County Londonderry, close to County Donegal in the Republic of Ireland and its ancient defensive walls are the most complete in Ireland. The city's name is a point of political dispute, with unionists advocating the longer name, and nationalists advocating the shorter. A common attempt at compromise is to refer to the county as "Londonderry" and the city as "Derry", but this is by no means universally accepted. Because of this, a peculiar situation arises as there is no common consensus either in politics or elsewhere as to which name is preferred; the city council is officially known as "Derry", but the city is officially recognised as "Londonderry" by the Northern Ireland Executive and the UK government. Whilst road signs in the Republic of Ireland use "Derry", alongside the Irish language translation "Doire", road signs in Northern Ireland will always read (unless vandalised) "Londonderry". Situated on the banks of the River Foyle, Derry is the second largest city in Northern Ireland and one of the oldest inhabited places in the whole island of Ireland. As they say there, 'Derry was a city when Belfast was still a swamp'. Derry's history dates back over 1,450 years, a lasting reminder of the early inhabitants of the area is the Iron Age fort, just over the border in County Donegal, known as the Grianan of Aileach. In the 6th Century St Columba/Colmcille established a monastery in Derry. Shifting ten centuries later to the Plantation of Ulster, King James I of England had the wealthy guilds of London build up the city of Derry (hence the title Londonderry) and surround it by the defensive walls that still ring the city today. These walls witnessed one of the most prominent events in the history of Derry. In 1688 the city was laid siege by the Earl of Antrim and the Catholic forces of James II, the English king who was deposed in favour of Protestant William of Orange. The settlers of the city who were protestant, barricaded themselves within the walls, when a group of apprentice boys from London on seeing the on coming forces, locked the city gates and so started the Great Siege of Derry. The siege was to be the longest in British history, lasting some 105 days, during which an estimated third of the city’s then population of 30,000 died through disease and starvation. When James II himself rode up to the city walls and lay down terms for surrender he was greeted with shouts of ‘No Surrender’. The siege was finally broken when the relief ship Mountjoy broke the boom which was laid across the River Foyle beside the city. However the legacy of the Great Siege of Derry lasted for centuries with the Catholic and Protestant communities in Derry remaining bitterly divided, something that was further fuelled by Ireland's partition in 1922. The city's close proximity to the border with the Irish Free State (later the modern-day Republic of Ireland), coupled with the city's much closer Catholic/Protestant demographic meant that conflict and outbreaks of violence were arguably worse than within Belfast. During the years of the Troubles, Derry witnessed some of the most prominent and terrible events of those times. It was on Derry's Bogside area that British soldiers shot dead 14 civil rights protesters in what became known as Bloody Sunday. The majority of the Bogside murals commemorate this tragic loss of innocents. Since the peace process in Northern Ireland, Derry is slowly emerging as an upbeat cosmopolitan city with great potential and huge tourist interest. In July 2010, Derry was awarded City of Culture for 2013. A lot of Derry’s sights are meshed with its history, the 16th Century walls which surround the city are among the oldest and the best preserved citadel walls in Europe. A huge percentage of Derry’s population fall into the 20 – 30 age group and there are plenty of places to cater for them with lots of clothes shops and boutiques, pubs, bars and clubs and Derry's traditional Irish and folk music scene are well established. City of Derry Airport  (airport code LDY) an airport serving Derry, Tyrone, and Donegal in the Republic of Ireland, located 11km north-east of the city centre. Ryanair  to Edinburgh and Liverpool. Taxis are available from the airport, with the typical fares to the city centre around £12, with the journey taking roughly 15 minutes. There is also a bus service but given the intermittent timetable, unless you're short of cash, you should just take a taxi. For details of Ulsterbus bus services visit Translink. The typical fare to the city centre is £2.70 and the journey takes approximately 20-30 minutes. Belfast has two airports, both serving quite a few international destinations. Belfast International Airport is situated 100km from Derry, whilst Belfast City Airport is located 115km from Derry. Both Belfast airports are served by a good bus connection to Derry city centre with Airporter . From Belfast city centre bus station, there is a bus service every 30 mins which takes just under 2 hours. It is also possible to get to Derry from Dublin Airport, 225km to the south-east. Dublin Airport is Ireland's international air hub, served by Ryanair, Aer Arann, Aer Lingus  and many other international carriers, with destinations in Ireland, Europe, Africa, North America and the Middle East. Buses link Dublin Airport and the Derry, running throughout the night. The journey between Belfast and Derry takes just over 2 hours and between Coleraine and Derry affords great views along the shores of Lough Foyle, which was described by Michael Palin as “one of the most beautiful rail journeys in the world”. From Belfast: Start on the M2 and you can either take the main road (A6)to Derry (signposted as Londonderry) via Dungiven or the scenic drive along the Antrim Coast, passing the Giant's Causeway. From Dublin: Take the M1 motorway and go as far as the signpost for Derry and Ardee. Then take the N32 whick links to the N2. Follow the N2 via Carrickmacross and Monaghan to the Border where the road then becomes the A5. Travel northwards via Omagh and Strabane until you reach Derry. (Note: North of the border road signs will read Londonderry, South of the border Derry). From Belfast International Airport: Take the main road to the M2 from the airport through Templepatrick. Follow the signposts onto the main road to Londonderry. It is worth bearing in mind that while the road signs will normally show "Londonderry" it is common to see vandalism where the "London" part has been spray-painted over leaving only "derry" remaining. It is also possible to see some signs where "derry" has been painted over and directions for "London" are on display. This is often done as a joke by kids and is not done to intentionally confuse or misdirect tourists. Translink's  Goldline Express No. 212 departs to and from Belfast regularly during the whole day. Dublin is connected with Goldine Express No. 274 and Bus Éireann service No. 33, which runs throughout the night. There is also a connection with the west coast with Bus Éireann service No. 64, which runs to Sligo and Galway, then onwards to Limerick and Cork. Full details of bus services are available from Translink and Bus Éireann  It's good to know that buses in Derry, although useful, don't run with the same frequency as in Belfast. Further services, aimed mainly at travellers arriving into the local airports are operated byAirporter . Derry is essentially split (by the River Foyle) into two main areas - The Waterside and The Cityside/Derry Side. The two banks of the river are connected by three bridges. The elder of these is the Craigavon Bridge, a double-decker bridge which once carried trains on its lower deck. A more recently constructed road bridge is the Foyle Bridge. This is a four-lane concrete bridge, which is further from the city centre. The east side of the river is known as The Waterside. This is traditionally the home of Derry's unionist population. The west side of the Foyle is usually known as The Cityside. This is predominantly nationalist and contains most of the tourist attractions, the city centre and The Guildhall. Here you will find the city walls and the Bogside. The city centre is small and suitable for walking. In 2011, the Peace Bridge was opened, which is a pedestrian bridge connecting the Waterside to the heart of the city centre, and in turn bringing the two communities, Catholic and Protestant closer together as well. As well as excellent tours around the city and its 17th Century walls, Derry also boasts a number of excellent visitor attractions. The Tower Museum is an award winning attraction, telling the history of the city and includes a range of exhibitions, while Derry's Guildhall, St Columb's Cathedral, St Eugene's Cathedral and St Augustine's Chapel are all historic buildings of stunning architecture. Other sights include the fascinating Bogside Murals found on the walls of what is known as Free Derry Corner and depict various events in the history of the town, from the Nationalist perspective. A more contemporary sculpture in the city, known as Hands Across the Divide, serves as a symbol of the two communities coming together. The city walls are the best-preserved in all of Ireland and make about a one-mile circumference around the city centre. Derry Walls with the Tower Museum in the background. The Walls were built during the period 1613-1618 by "the honourable the Irish Society" as defences for early 17th century settlers from England and Scotland. The Walls, which are approximately 1 mile (1.5 km) in circumference and which vary in height and width between 12 and 35 feet (4 to 12 metres), are completely intact and form a walkway around the inner city. They provide a unique promenade to view the layout of the original town which still preserves its Renaissance style street plan. The four original gates to the Walled City are Bishop’s Gate, Ferryquay Gate, Butcher Gate and Shipquay Gate to which three further gates were added later, Magazine Gate, Castle Gate and New Gate, making seven gates in total. Historic buildings within the walls include the 1633 Gothic cathedral of St Columb, the Apprentice Boys Memorial Hall and the courthouse. Take a walk around the "Free Derry" corner between the Bogside and the western side of the old city walls. Stop and look at the political murals made by local artists during the 90's, depicting key events in the harsh conflict haunting Northern Ireland. In the same area, the Free Derry monument, Free Derry Museum, and Bloody Sunday memorial are also located. Taking a guided tour of the Bogside is probably the best option for visitors, but please be warned, it is highly advisable to stay away from this area in the dark hours, especially at the weekend, as the area has a reputation among the locals as being one of the rowdiest areas of the city at these times, but saying that the area should be quite safe during the day. Tower Museum, Union Hall Place, Derry. Considered the main museum of the city, it tells the story of Derry from pre-historic times to the foundation of the city in 542, the siege of 1689, the Irish Famine of 1846, the partition of Ireland in 1921, the recent conflict of 1969-1994, up until modern times. The museum now houses a new exhibition of the Spanish Armada. Voted European museum of the year in 1994. Railway museum, Foyle Road, Derry. Details the city's railway heritage and four railway companies. Harbour Museum, Harbour Square, Derry. The city's maritime musuem. Workhouse Museum, Dungiven Road, Derry. A restored workhouse showing what conditions were like during the Irish Famine. Genealogy Centre, Butcher Street, Derry. Trace your Irish ancestry! Free Derry Museum, Glenfada Park, Derry. A museum of the Northern Irish conflict. A section is dedicated to the Bloody Sunday and its aftermath. The People's Gallery, Rossville Street, Derry. The "Bogside Artists" , who painted the murals in the Bogside, tell the story of over thirty years of turbulent history and unrest through their paintings. 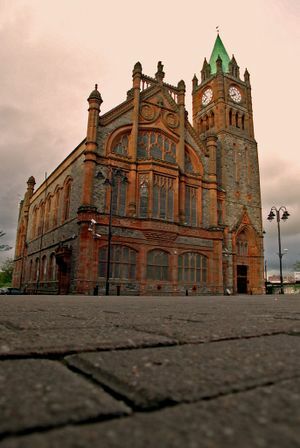 Apprentice Boys Memorial Hall, Society Street, Derry. A musuem is housed in the main building detailing the history of the Apprentice Boys and their prominent role in the 1689 Siege. The city is host to an annual Halloween Carnival on the 31st October. Upwards of 30,000 revellers dressed in fancy dress costumes throng the streets and bars til the early hours. It is the biggest festival of its kind in Ireland attracting visitors from as far as Australia, Japan and the USA. Information on each year's festival can be found on the Derry City Council website. Almost everyone you meet on Halloween night will be dressed up so wearing a costume is recommended. Derry City Football Club play their home matches at the Brandywell Stadium, in the Brandywell area of the city, with most league matches taking place on Friday night. This club plays in the League of Ireland Premier Division (the league of the Republic of Ireland). Visitors to the club are assured of a warm welcome and a lively atmosphere, with the club being one of the top teams in the whole island. Magee College is a campus of the University of Ulster located in the city. Most of Derry's retail stores are situated well within walking distance of the city centre. The main shopping malls are Foyleside  and the Richmond Centre . Between them, these malls contain many of the stores which one would expect to find in any city in the UK or Ireland, such as Marks & Spencer, Debenhams and Dunnes Stores. Derry's last remaining home-grown department store is Austins, in The Diamond, which claims to be the world's oldest independent department store. Be sure to visit Guildhall Square during the day, where a local market operates. The town centre is very busy on a Saturday as many travel from the Republic to take advantage of Pound/Euro differentials. However Sunday is very quiet and many shops will only open from 12-6pm. NB: If visiting on a Monday or Tuesday, a lot of restaurants in Derry have offers of 33-50% off meals on those days so it is worth checking those deals out when you arrive. Fiorentini's: Italian-owned cafe, known throughout the city for its great value meals, and home to the best ice-cream in town. Be sure to try the Knickerbocker Glory! Great food, staff very helpful, especially the three owners. Danano's: A really nice Italian that is relatively cheap but great food. Badgers: A great port of call for lunch while shopping. Can be crowded and cramped at busy times. Derry is a small city with a recent turbulent past. Odds are, you shouldn't have any problems, but be aware of tensions. (see "Stay Safe" below) For it's size Derry has a large selection of bars and pubs, but those looking to try local Irish beers will be sadly disappointed as international brands dominate the Derry pub scene. There are 2 local breweries, Northbound and Walled City. Located in the centre of the city, just outside the Walled City, Waterloo Street is a steep hill lined with some of the city's liveliest bars. Peadar O'Donnell's, 63 Waterloo St, phone +44 28 7137 2318. If you are looking for traditional Irish folk music sessions, this is the best place in Derry. Such sessions are held nearly every day of the week, and both locals and visitors create a nice atmosphere. Drinkers can access Gweedore Bar through an interior door. Gweedore Bar, Waterloo Street. Geared purely to live music but with a more contemporary band nature than Peadar O'Donnells. Here you can listen to line ups of all ages strutting their stuff giving their interpretations of all the favourites and some original self penned music. Upstairs is in a nightclub-style, with disco nights. Wetherspoons, The Diamond. Part of the UK Wetherspoons chain this bar serves cheap drinks and affordable meals. Pints start at £1.55 (as of Dec 15) and it is the only bar that serves cask beer or real ale. The Metro, Bank Place. You'll find this charming bar in the shadow of the imposing city walls. The décor is interesting, with intriguing bric-a-brac collected from around the world, and lots of alcoves provide an intimate atmosphere. The pub grub here is of a high standard and features every thing from soup and sandwiches to a hearty beef stew. A night the upper level transforms into ad hoc dance area, filled with a young crowd. Complete with a roof-top smoking area, great on a sunny day. Walled City Brewery, Ebrington Square. Across the Peace Bridge is the town's only brewpub serving a big selection of their own beers as well as other Irish and International craft beer. NB: Due to licensing laws, to have a beer you must order food. Tapas dishes start at £2.50 and purchasing one per person is sufficient. The Merchant's House, 16 Queen Street, phone +44 28 7126-9691/4223. A wonderful old house with Bed and Breakfast. Nice and clean, good breakfast. No en suite bathroom because it would be a pity to change the house. Groarty House And Manor, Groarty Manor is a newly built house, set in its own one acre site surrounded by trees, and is tastefully furnished in warm relaxing colours. Has disabled access and disabled bathroom facilities on the ground floor. Telephone +44 28 7126-1403. It offers a great base for touring County Londonderry, Donegal, and Derry City itself with its historic walls, museums and various other tourist attractions. Da Vincis Hotel  - 15 Culmore Road, Derry BT48 8JB. Modern four star hotel, 2km north of the city centre. Large bar and good restaurant. Free car parking. Broomhill Hotel, Limavady Road, Derry BT47 6LT, Tel: +44 28 7134-7995. Three star hotel, 3km north of the city centre on the east bank of the river (Waterside). Free car parking. The Waterfoot Hotel & Country Club,14 Clooney Road, Derry BT47 6TB, Tel: +44 28 7134-5500. Located 5km north of the city centre on the east bank of the river (Waterside). Free car parking. BT48 Apartotel  - 5 Star Self Catering Accommodation, luxury 1-3 bedroom apartments on the banks of the River Foyle. Beech Hill Country House Hotel, 32 Ardmore Road, Derry BT47 3QP, Tel: +44 28 7134-9279. Five star hotel as stayed in by Bill and Hilary Clinton. Small hotel in a converted country house, located in large grounds 5km east of the city centre on the east bank of the river (Waterside). Free car parking. After Belfast, Derry was the main centre of trouble during Northern Ireland's conflict. As a majority Catholic city, although significantly improved, some tensions still remain between the Republican and Loyalist communities in some parts of Derry. Wearing items of clothing which would identify you as being from any particular religious denomination or political viewpoint (for example Rangers or Celtic football shirts) is not advised. As a rule of thumb, refer to the city as "Derry", as calling it "Londonderry" could offend or alienate some people with whom you are speaking. The prefix "London-" is often not used in everyday speech - the majority of Catholics and a number of Protestants refer to the city as "Derry". Derry was awarded Purple Flag status in October 2011, which recognises that the city provides evening visitors with an entertaining, diverse, and safe night out, and has brought the Purple Flag accreditation to Northern Ireland for the first time. For someone not familiar with English, the Derry accent can be quite challenging to understand at first (sometimes even to the native English speaker) and they tend to speak quite loudly and fast. However, if they know you are not from the area they will more than likely make an attempt to be more understandable. Offence will not be taken if you ask them to slow down while speaking. The city is built on some quite steep hills and a lot of walking up and down these hills will be required to see all the sights. They can become quite slippery in cold weather. The city itself is quite small, making it easily to escape to the surrounding countryside. County Londonderry and nearby County Donegal have a wealth of green fields and sights to appeal to nature lovers. Ulsterbuses can be used for outings. These are operated by Translink. A trip to the Giant's Causeway on the north coast is highly recommended. If you have a choice, come early in the morning or late in the afternoon to avoid crowds of tourists treading all over the place. Translink operate buses to and from the Giant's Causeway from both Derry and Belfast. Not far outside Derry, across the border in Donegal is Grianan of Aileach. This ancient stone fort is on a hilltop between Derry and Letterkenny and affords superb views of loughs Foyle and Swilly, and of Derry itself. This page was last edited on 20 March 2019, at 11:03.